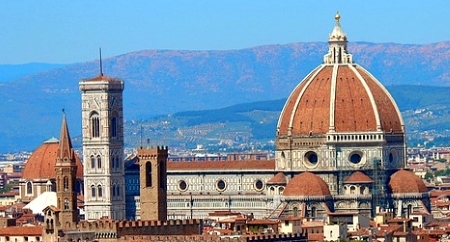 The cathedral of Florence belongs to the top 5 sights in Italy. It is one of the largest churches in the world. The dome from the 15th century is also very famous. At that time, the construction of a dome of this gigantic size was not technically possible. The fact that the dome was nevertheless completed is almost a miracle. The cathedral of Florence is the center of the city. 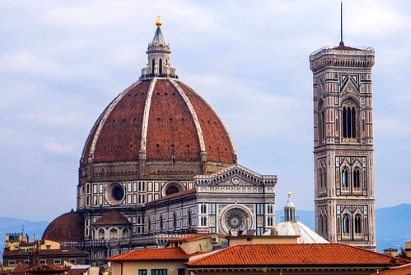 The Florence church dome is an incredible 107 meters high and has a diameter of about 45 meters. The church is a gigantic 153 meters long and is probably the longest church in the world. They wanted to build a church in which all inhabitants of Florence could find a place. The Florentine cathedral is 38 metres wide, so it is a very large church. The cathedral of Florence can be visited free of charge. Visitors are amazed when they look up under the dome. The dome is painted inside, but you need binoculars to see the details. The paintings are 80 to 100 meters away from the viewers. You have to pay admission for some other things. There is only one ticket valid for 48 hours. This ticket for the Cathedral of Florence includes the ascent on the dome, the ascent of the bell tower (Campanile), the Cathedral Museum, a smaller exhibition in the basement of the Cathedral (crypt), as well as the huge outbuilding baptistery. This short film shows the cathedral from the inside. It is a modern 360-degree video. You can rotate the mouse in all directions. You can see a lot , the highlight for the majority of the visitors is the walk on the dome and the view from above on Florence and the area around the city. Note: If you are afraid of heights, claustrophobic, have little walking safety, are not fit or have any other problems, you should think twice before going up the tower of the cathedral and the dome. The path is narrow and not easy. In bad weather the dome is closed. In the season the waiting times (queues at the entrance) are often very long. We waited several hours. This is especially true for the Florence cathedral dome. Another highlight is undoubtedly the Baptistery of the Cathedral of Florence. You should also have a closer look at the facade of the cathedral. It is made of marble in three different colours: White, green and pink. Beautiful! Also the Campanile and the Baptistery have a façade in the same style including the colours. The cathedral museum is also worth a visit. Here are many sculptures and other things, which were before in the church, exhibited. The Cathedral Museum is located in a building behind the large church. The exhibition is well signposted and easy to find. During our visit at the beginning of 2019 there was only one combi-ticket for all sights described under Opening Hours (except the cathedral itself, which does not cost admission). This ticket costs about 18 Euro for adults and is valid for 48 hours as far as we know. So you don’t have to watch everything in one day. Children under 6 years are free, children under 12 years pay 3 Euro entrance fee. Of course, such a combined ticket has advantages and disadvantages. If you want to have a look at everything, you will get away relatively inexpensively. For example, if you don’t want to or can’t go to the dome and the Campanile (church tower), you still pay 15 euros for a ticket. Cathedral opening hours: daily from 10 a.m. to 5 p.m., but on Sundays only from 1:30 p.m. to 4:45 p.m., probably because there is a service in the morning. Dome Florence Ascent: 8:30 a.m. to 7 p.m., on weekends shorter in the evening (Saturday to 5 p.m., Sunday to 4 p.m.). Baptistery opening hours: Mon – Sat: 8:15 to 10:15, then small break and again from 11:15 to 19:30. On Sunday continuous from 8;15 to 13:30. Ascent bell tower: Very long opening hours every day from 8:20 to 19:15, also on weekends. Crypt (crypt under the cathedral with exhibition): Every day from about 10 am to 5 pm, but closed on Sunday. In Italian the Dom is called Duomo or Cattedrale. The full name of the famous church in Florence is „Cattedrale di Santa Maria del Fiore“. It is the bishop’s church of the archdiocese of Florence. The Baptistery is called „Battistero di San Giovanni“ in the national language. The bell tower, as always in Italy, Campanile. The word comes from Campana, which means bell. The organ in the cathedral of Florence is relatively new (built in 1961). To our knowledge, the instrument was made by Mascioni in the north of Italy.